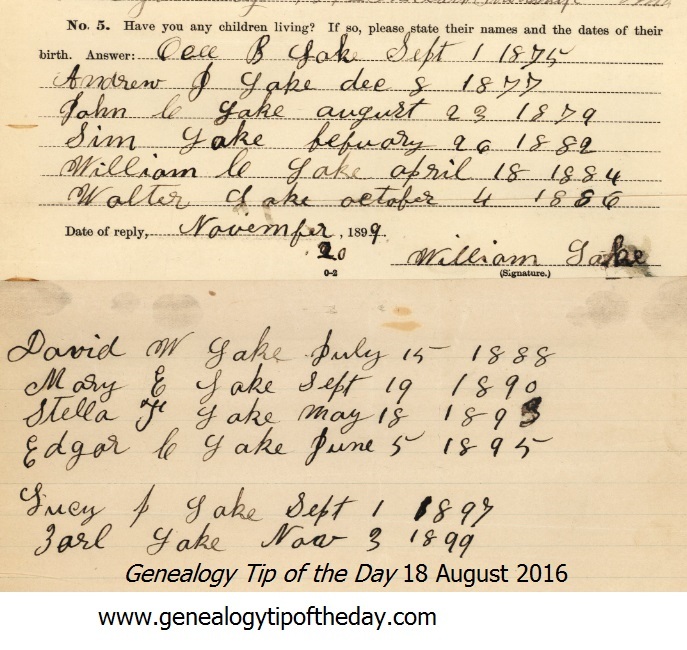 Today’s Genealogy Tip of the Day included an image of a list of children with their dates of birth for Union Civil War veteran William Lake (Company I, 49th Missouri Volunteer Infantry). The list was not created for genealogists and it was not simply busy work generated by the pension office. The list was submitted by Lake in response to a mailer from the government as he was already receiving a pension at the time the list was requested. Not every pensioner provided the information, for a variety of reasons. The request for information was pre-emptive. Lake had minor children at the time he submitted a list of children. The pension office wanted a list of his children, submitted by him, so that if he died while the children were still minors and those minors submitted a pension claim, the office already had a list of his children. The children would also likely have had to have shown that the father’s death was due to his military service. Because sometimes after veterans died, “new” beneficiaries would come out of the woodwork. This way the pension office already had a list. Lake lived long enough that his children never qualified for a children’s pension. But the list was there, just in case he died. Such lists can also be a cross-check to verify identity of a widow who was also asked to list children’s names/dates. However, the widow of a deceased veteran cousin, his second wife, defeated this purpose by listing only her children with the deceased veteran — totally omitting mention of the first wife’s children. One must carefully read the entirety of these pension application files. True. One reason for children being omitted in the lists submitted by pensioners is that adult children usually don’t qualify for a children’s pension. 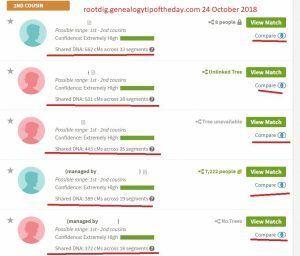 Another relative who had several children only listed the ones under the age of 16 when he was given the survey. How very interesting! Now I know why I have the information too. Just didn’t know what that information was there. Makes sense. Thank u. There was no mention of children that I have been able to find for my John Alexander until after his death in 1868. It was over 20 years later that his only child, Charles, filed for a dependent pension based on his father’s service. Perhaps that is why the file is over 160 pages, mostly filled with depositions from friends and relatives of John and Charles attesting to Charles’ relationship and John’s service-related disease. It’s a goldmine! Oh, and the pension was denied initially and on appeal. There was one form that asked the names and birthdates of the children “living and dead”. It didn’t ask for death dates, but some people included them.